For the mango coriander dipping sauce, in a blender, add mango, lemon juice, water, salt and sriracha. Blend until smooth. Add the coriander and pulse 2-3 times till the coriander is chopped very fine, but green specks are still visible. Remove into a bowl and refrigerate till ready to use. To start making the rice paper rolls, create an assembly line of sorts. Take a cup of water in a shallow dish which is wide enough for the rice paper roll to sit comfortably without bending or breaking at the edges. In another plate, keep all your veggies together. Take one rice paper and dip it in the water for 5-10 seconds. Remove the paper and place it flat on the counter. It may still feel crisp, but don’t worry it’ll soften up pretty quickly. Don’t be tempted to dip it for longer than 10 seconds. Place all the veggies and the mint leaves towards one end of the paper, leaving some space to fold. If your veggies are placed horizontally across the rice paper, fold both the sides to the centre in such a way that they are a bit on the veggies. Now start rolling the sheet as tightly as possible without breaking it. Continue doing the same for the remaining rice paper till you have 7-8 rolls. Cover with aluminium foil to keep them from drying out. 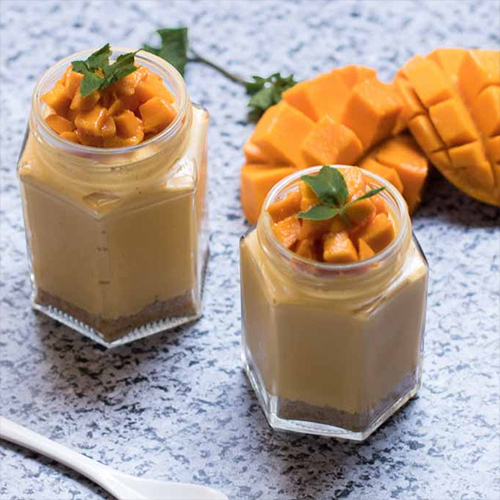 Serve cold with the mango coriander dipping sauce. The first step is to make the mango salsa. 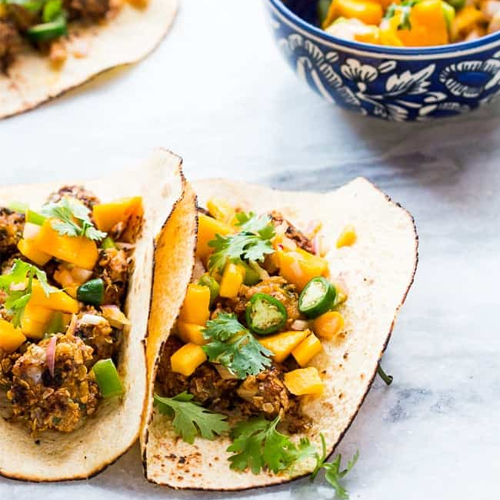 Combine all the ingredients under mango salsa and refrigerate while you prepare everything else for the tacos. Cut fish fillets into bite sized pieces and place them in a plate. Whisk together the egg and salt in a separate bowl. In another plate, empty content of the flavoured saffola instant oat packets. Now you’ll have three dishes in front of you – one with fish, one with egg and one with oats. Heat oil in a skillet. Dip each piece of fish in egg first and then coat it with oats and slide them one by one into the pan. Cook on both sides for 2-3 minutes each and remove on a plate lined with tissues. To assemble, warm tacos on an open flame and divide fish pieces and mango salsa equally between them. Top with sliced jalapenos and fresh coriander. Serve with a mug of beer! Once filled, tap the jars to remove any extra air bubbles. Top the jar with some more mango pieces and some mint. Refrigerate for 2 hours and enjoy!